This post was long in coming. These photos were taken at the Easter Picnic our Washington D.C. Meetup group held the weekend of April 23rd. But then school, research, travel, and work snuck up on me. But taken the other way, you now have over 6 months to get ready for the next year’s Easter celebration. Slovak Easter traditions are definitely quite unique! They basically consist of guys chasing girls around with switches weaved from willow branches and also pouring buckets of cold water on them. The girls then reward the guys with beautiful decorated Easter eggs, and other treats like home-made kolache and shots of slivovica, the East-European plum brandy. 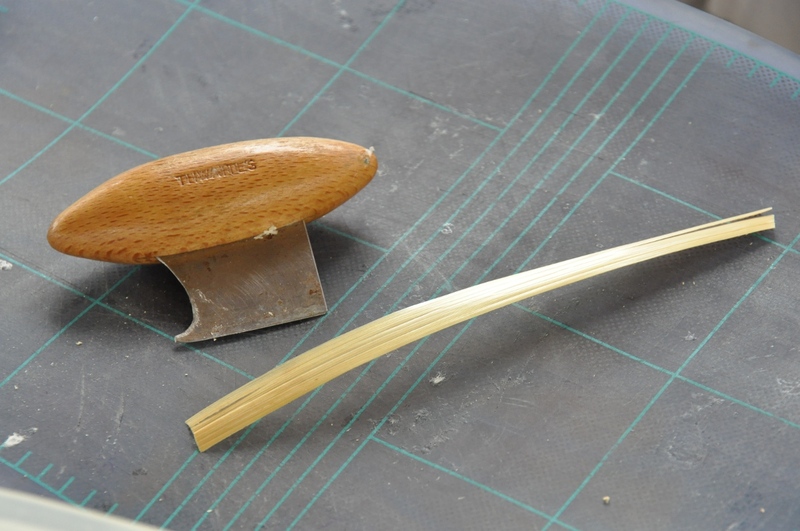 Part of growing up for guys was learning how to make these whips. I may be a bad Slovak, as I never learned. So it was great that Joan D., our local crafts lady, came to give us lessons. You will need 8 willow branches. If you can’t find willow, use similar flexible straight vines or twigs. 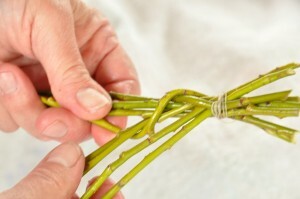 The twigs need to be fresh and flexible, otherwise they’ll break. The young and flexible nature of the twigs is also believed in the pagan tradition to transfer these qualities to the girls, making them young and healthy. 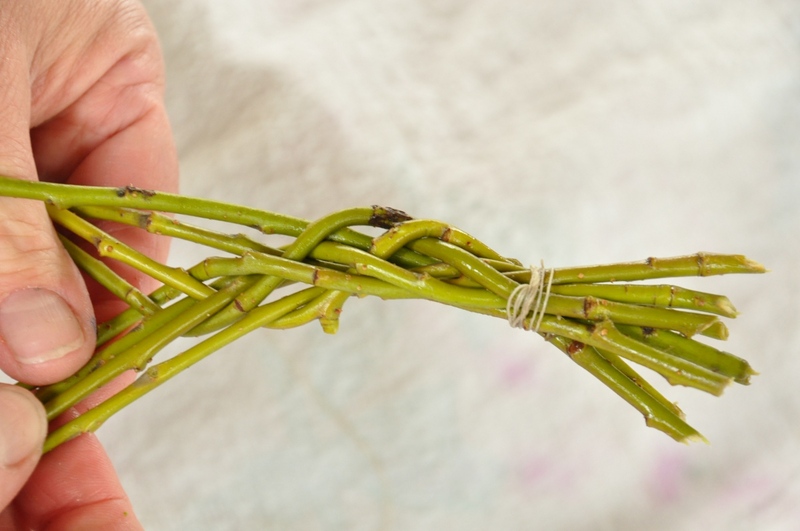 Arrange the branches in a row, and tie the ends together. 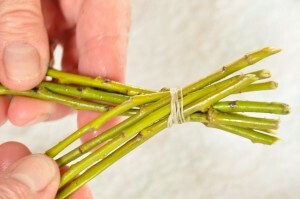 Next separate the 8 twigs into two halves of four pieces each. 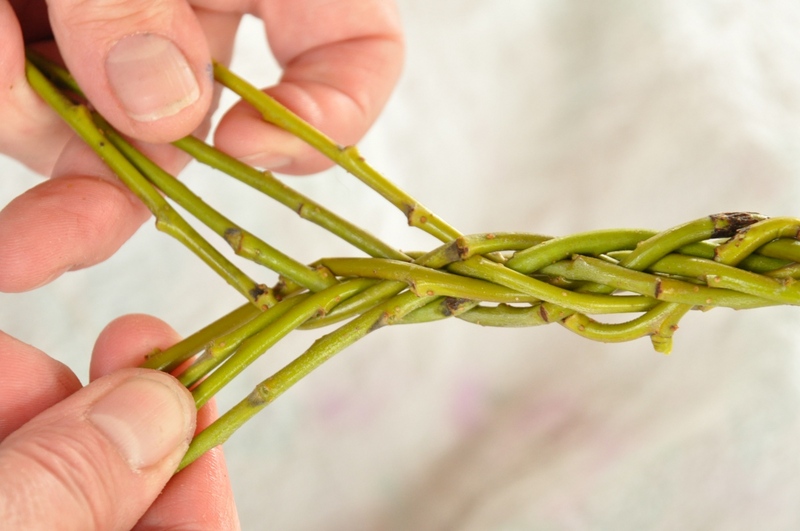 Take the outermost branch in the left group and run it from the front to back in between branch 2 and 3 in the right group (through the middle). Wrap around the back and bring to the right-most position in the left group. 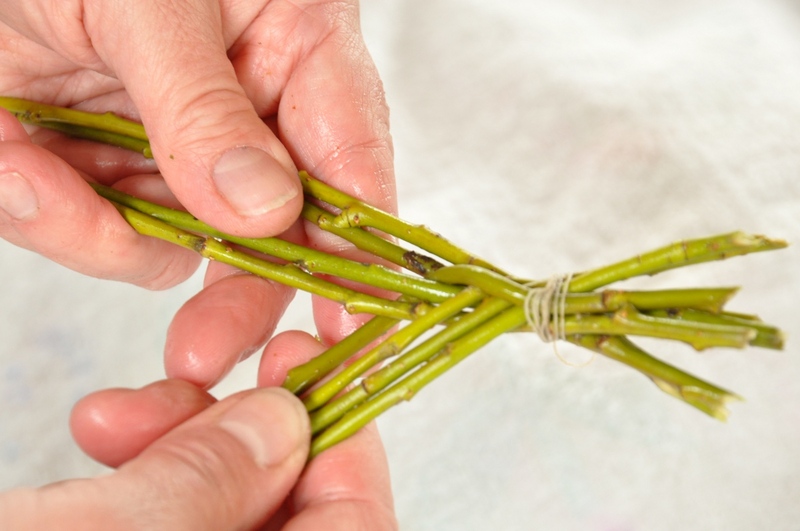 Repeat this with the right-most twig in the right half. And that’s the whole process. Basically, if you have from left to right, L1 L2 L3 L4 R1 R2 R3 R4, branch L1 goes front to back between R2 and R3 and becomes new L4. Then branch R4 goes front to back between L2 and L3 and becomes new R1. 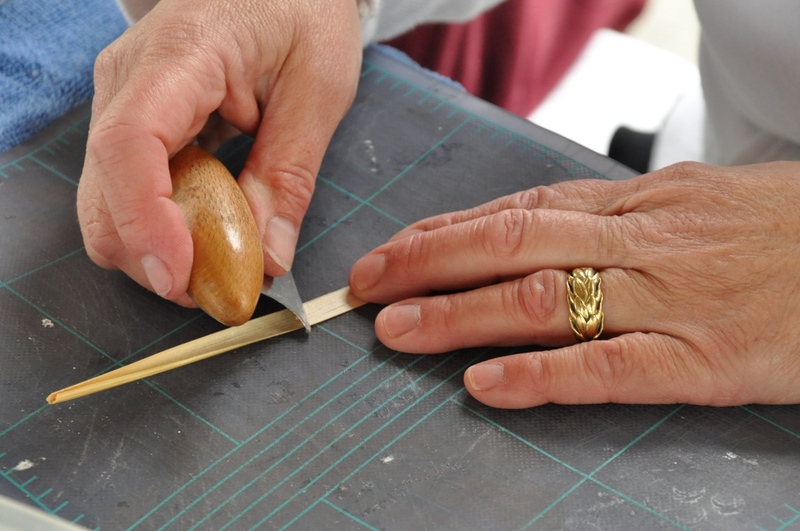 One trick in this whole process is to keep the whip stiff. 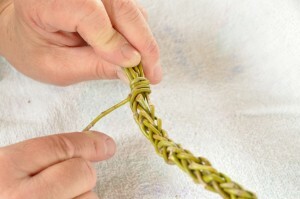 This means that after each twist, you need to tighten the whip by pulling the two halves away from each other slightly. 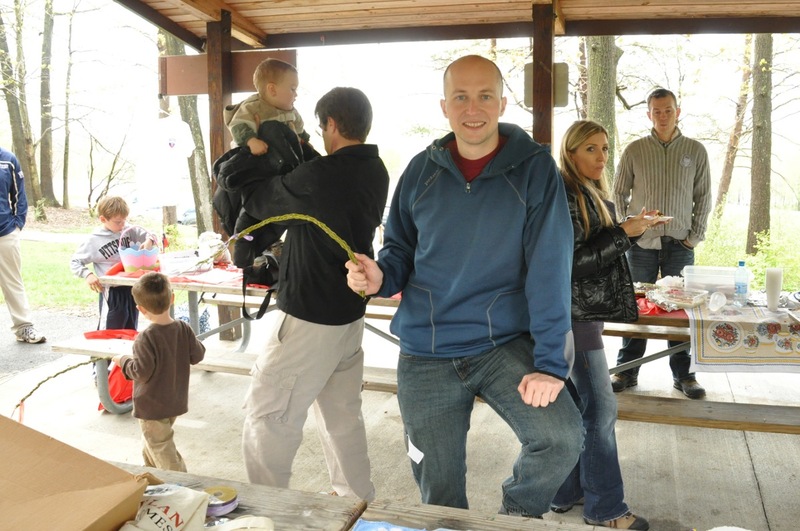 I was not very good at this and my whip ended up quite limpy. 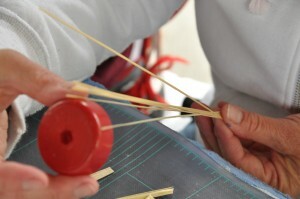 Joan also showed us how to make the straw eggs. Easter eggs are made by first blowing out the egg insides. 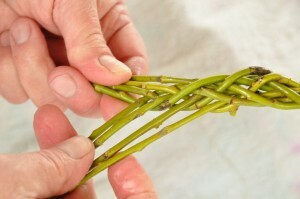 I remember doing this every Easter as a kid. Definitely not a fun activity, but probably a good way to expand your lung capacity. You start by puncturing a small hole with a needle on both ends of the fresh egg. 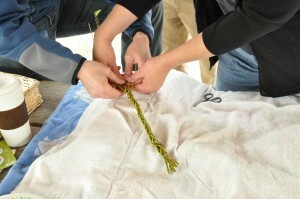 You then move the needle around to expand the hole slightly until it’s big enough to blow the insides out. It should be about 2 or 3 millimeters in diameter. 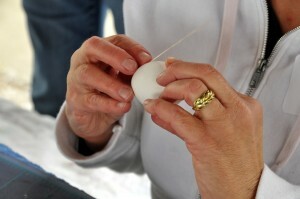 Once the egg is hollow, it is next dyed. There are many ways of decorating the eggs, my favorites are the ones painted with hot wax. 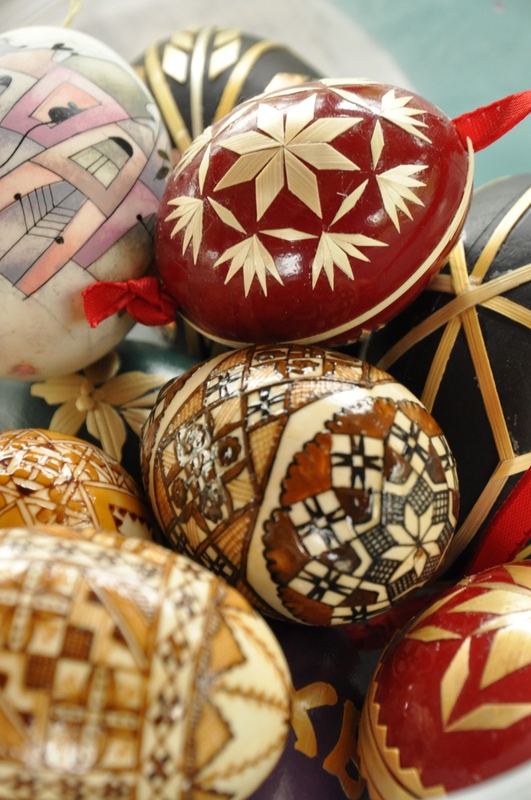 Another beautiful variation are these Easter eggs decorated with pieces of straw. You first need to cut and straighten the straw. 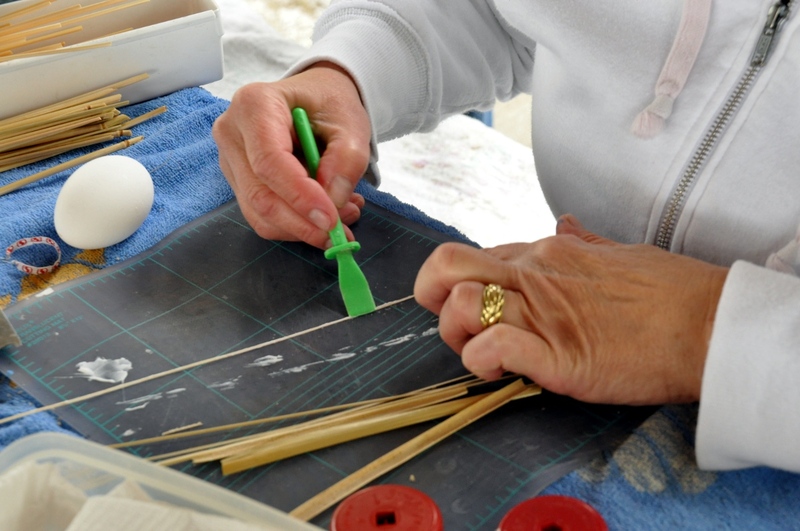 Joan had this interesting custom made straw cutting tool that allowed her to to first cut it by running the metal part through the inside of the straw. The metal edge was then used to flatten it. 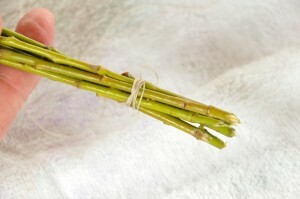 She next used this other straw splitting tool to separate the single strand into many fine fibers. These fibers can then be glued onto the egg to create elaborate shapes. 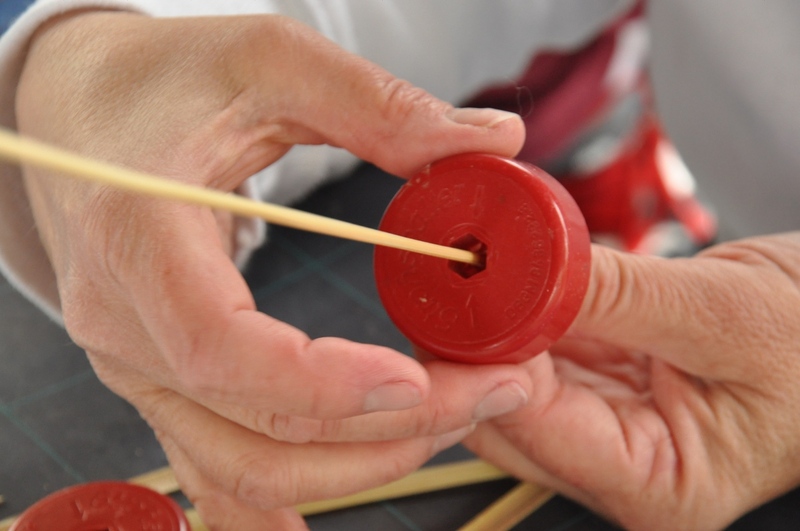 Similarly, small pieces of straw can be cut and glued on. We ran out of time, and didn’t have any dyed eggs. Let me know if you are interested in a similar hands-on workshop, we can organize something here in the D.C. area. Here is a photo of a similar finished Easter egg. making the handle fro the whip. It can be simple (wrapping another twig around) or really sophisticated and nice looking. here is a video (4 of them) showing the complete method of really nice looking whip. 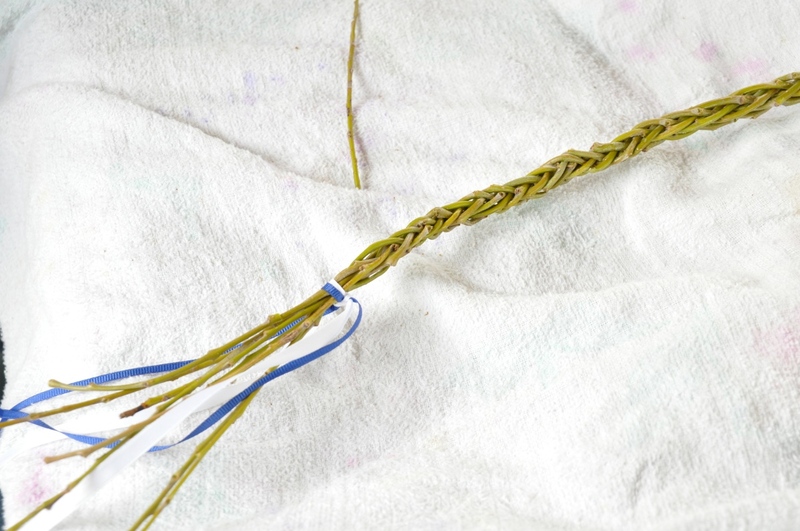 BTW, I remember that when making it as a young boy, we also used just a bark from a wilow branch to wrap around to make the handle.